Process transmitter for measuring vacuum, steam, food, pharmaceutical, oil, gas and other pressure readings necessary for the monitoring and control of bulk production processes. The XMPi process pressure transmitter is designed for use in a harsh process industry environment and includes all the extra mechanical protection required for a long service life. The hygienic flush diaphragm version of the XMP i pressure transmitter can be used in food or pharmaceutical processes such as canned food, breakfast cereal, sugar, dairy, confectionary, soft drinks, medicines, beer and spirits production. For high temperatures it is possible to fit a cooling element which protects the electronics from damage from media up to a temperature of 300degC. Suitable for deploying in many locations and feeding pressure readings back to the site distributed control system (DCS). The XMPi includes a HART protocol interface, 10:1 adjustable range scaling and ATEX intrinsic safety as standard, with options for flameproof, 300degC media temperature and integrated local digital indicator. Available in pressure ranges from 0-400mbar up to 0-600 bar gauge or absolute, and compound ranges from -0.4 to +0.4 bar up to -1 to 10 bar gauge. To check, rescale or recalibrate the XMP-i, the process transmitter settings can be accessed via a standard HART communicator connected across the 2 wire 4-20mA loop wire connections. For extra protection in more aggressive or cleaner environments the aluminium die cast housing can be substituted with a Stainless steel 316L housing. We are looking for a flameproof approved pressure transmitter to measure from 500 to 1500 mbar for ambient barometric monitoring in a hazardous area classified chemical distillation cabinet. The XMPi is available with ATEX flameproof certification and the output from a standard 2 bar absolute range can be set to 500 to 1500 millibar absolute at the factory or by the user via the HART communications. I require a 30 psi abs pressure transmitter/transducer with a 1/2 NPT process fitting, that I can use, that is approved for use in a hazardous area, however I do not want to have to use a barrier with it? The XMPi has been flameproof (Ex d) approved and certified to II 2G Ex d IIC T5 Gb, so you can use it as part of a flameproof installation which does not use barriers. Is it possible to install the XMPi process pressure transmitter on a vertical stack with one of the flange style fittings? If so is it possible to change the orientation of the display when the transmitter is mounted vertically? Yes, the XMPi can be installed in any orientation, the only effect you might notice is that there is a slight zero offset due to the changing weight of the internal oil fill pressing on the diaphragm, this is known as the “g” effect. The display can be rotated to the required position by removing the metal cap and rotating the display and operating module by hand to the required position. Is it possible to manually adjust the zero and span calibration settings of the XMPi process pressure transmitter without having to connect a HART communication device? 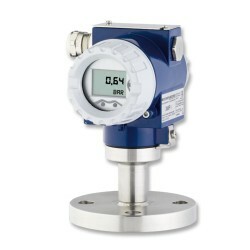 This intelligent pressure transmitter is fully configurable via the push buttons immediately below the LCD display, but only if the integrated digital indicator option is fitted. 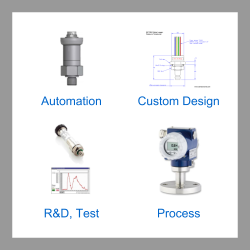 Please select the options you require for the XMPi Process Plant Gauge and Absolute Pressure Transmitter in your application and request a quote. Silicone oil fill, 300C, FFKM seal, 100bar max, vac 150C max. Send us your enquiry for XMPi Process Plant Gauge and Absolute Pressure Transmitter to get assistance with this product type.